Painting trip to the top of the world. There is a hesitation in writing about such an incredible experience, because words don't seem to do it justice. Adjectives seem trite and meaningless next to the grandeur of nature that towers above you. But, in an effort to share the journey and my attempts as a painter to capture what I could, I must start somewhere. My introduction & preparation is in my previous blog here. And the scientific aspect of the expedition is outlined on the Elysium website here. I took with me enough materials to paint in oil, draw in charcoal & white chalk, and sketch in my large moleskine. It wasn't possible to paint everyday, due to the weather, constant movement, and the various outings to spot animals. The trip takes us through Svalbard, along the pack-ice at 81°N, to east Greenland, and finishing in Iceland. It starts with flying to the world's most northern airport of Longyearbyen, an old mining town. This town is literally on the edge of wilderness; it is prohibited to walk beyond the village's perimeter without an armed guide. Beyond this row of mountains there is nothing, or rather everything, depending on your point of view. It is the land where the polar bear reigns supreme. The light is everywhere, with a constant glow through the clouds throughout the day and night. The instinct to sleep is absent. The light keeps your body switched on, and the grand proportions of the landscape are hypnotizing. People I meet are from all over the world, and of course, a certain type: practical clothing, beards, world travellers, seeking to face the elements. To get accustomed to the upcoming temperatures, I spend these few days painting and sketching outdoors. Cold fingers are always the first thing that prevent us from working for long periods outdoors. I've tried many different methods, and I explain here what works and what doesn't. The issue with shifting light here, is not in its intensity or elevation, but in its orientation. The risk is to feel comfortable about the general consistency of light, and not realising that the sun has moved across the sky so far, that you are no longer painting what you started with. 29th August. We embark on the Polar Pioneer. Before we even leave the bay, an obligatory emergency drill to familiarise everyone with the onboard escape routes, the life jackets, and the “coziness” of the life rafts. The light is low as we depart, as we follow the edge of the distant glacier that I have seen looming over this town from afar, for the past 3 days. 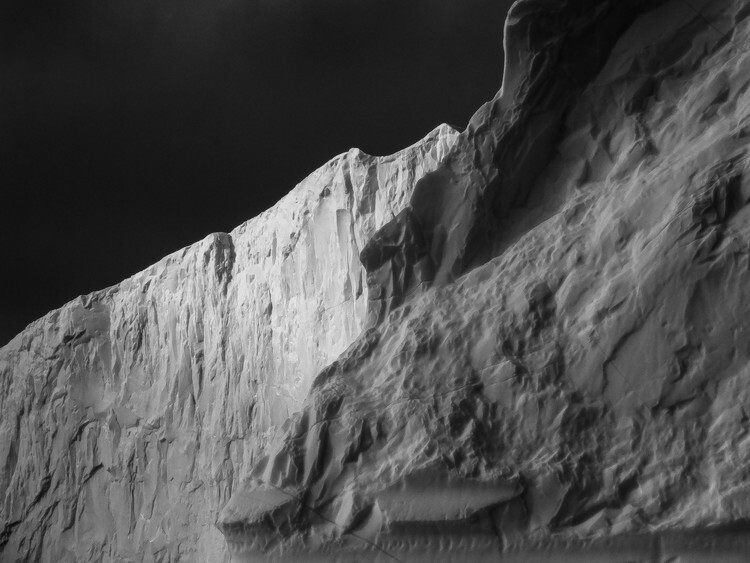 Glaciers: living mountains of ice, sliding, crunching, and sculpting the earth below it. Aside from offering stunning designs, colours, and sounds, they are a monumental presence. Connecting air, land and feeding the sea with icebergs. 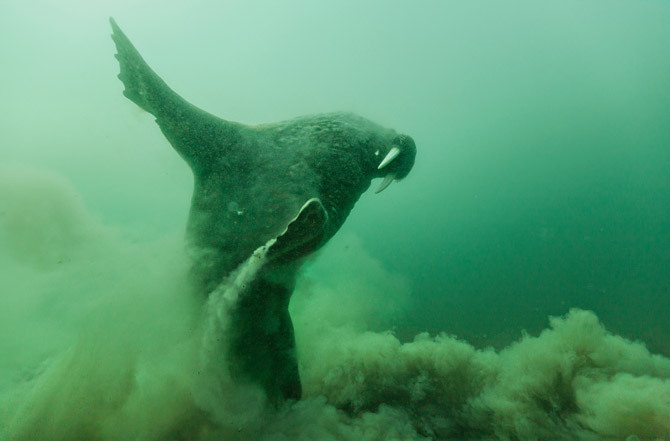 They are the quiet giants of this world, and I can’t wait to get up close. The first days are filled with zodiac cruising out in the ice filled fjords, roaming untouched expanses of nature, encounters with unfamiliar creatures that, unlike us, are built for this unforgiving environment. Predictably, this large expanse of nature is belittling, but it is the sheer unforgiving elements that reduce our human size, or the human ego to minimal proportions. Back on the ship, from the top deck in this bay, I paint my first view: a glacier. The ship is anchored, and I set up facing the glacier, but the ship is very slowly moving around. Several times, I have to shift my easel around the deck to keep track of my subject. It's sunny, and with no wind, my fingers last long enough. The bay offers us sights that were not expected so early in the trip. Arctic foxes, reindeer, bearded seals, arctic terns, and several pods of belugas just feet from us. The area is filled with ice, big and small, with fascinating erosion patterns. Alkafjellet, where some go scuba diving, to discover all sorts of creatures below in the dramatic sheer face of the plunging cliffs. Above water we see the last of the nesting guillemots, and arctic foxes, picking up the fallen fledglings. Phipps island, part of the seven islands. Grey, cold and windy today. We got very close to walrus today. Naturally curious, they kept swimming towards us, as our zodiac pilot (Goran Ehlmé) continuously positions us so that we have an escape route, in case they decide to come and try their tusks out on our soft little boats. Goran Ehlmé is particularly knowledgeable about this species, considering his extensive commitment in documenting their unique feeding patterns underwater. And his naps in their company while filming for the BBC. 14 hours after the walrus, and we are at the pack-ice. We wake up to the sound of ice scraping along the side of the hull, as we push through. We are at the furthest northern point for a non-commercial ship, before needing an ice breaker: 81°N. Our ship is ice-reinforced, and pushes these blocks out of the way relatively easily. The ship was moving slower, so I could have a bit more time to work. Even if the blocks were passing us by, I tried to capture what we were seeing, in the same manner as I would design shifting clouds or waves in plein-air. Now firmly in the pack-ice at 81°N, we push through slowly, breaking and pushing ice apart. In our wake, many arctic birds are feasting on the organisms that we have uncovered, from under the ice blocks. The puzzle pieces of ice are getting closer together. First, just isolated pieces of ice surrounded by water. Then, it's the other way around. As we advance, we start spotting tracks. Foot prints. 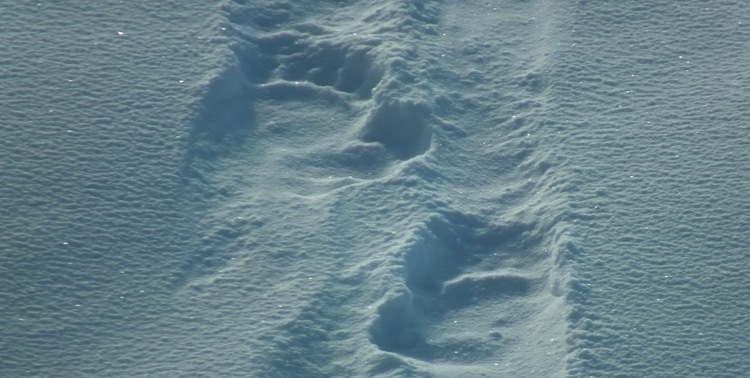 Bear prints. But they would appear randomly, disconnected from other blocks of ice. Impossible to know which way the bear was really going. How many times has this ice been rotating? 15 mn later, another set of tracks. But soon, they were coming together, and a clear line could be seen going over several patches of ice. Next to me with his binoculars, Eirik Gronningsaeter, our bird expert, is fixated on a spot in the distance. He starts whispering that it may be a bear. We see an unusual dark spot in this bleached out scenery. Then a red spot to the right. Eventually a pale yellow spot to the left. As we get closer, all is revealed: A kill, and a messy one at that. An incredible sight of a large healthy bear with a hearty meal. I am told that polar bears don't really hibernate in winter. Instead, their metabolism slows down and their brain shuts down by 50%. After such a large meal, he was ready for a nap. As he lay down on the ice, I grabbed by brushes, and attempted a "bear-portrait" sketch. He eventually got up and moved away. We did not follow, as protocol demands us to limit our interaction with flora & fauna, to avoid undesirable alteration in the natural order. If animals wish to approach, we are prepared, but we do not chase after wildlife. Sketching up in the bridge, which the Russian crew finds entertaining. Most ships today do not allow passengers into this area, but this crew is very accommodating. The ice landscape here is surreal. From the ship right to the horizon, there is only one surface: floating ice. You could probably walk and hop across this frozen ocean for hundreds of miles, as you long as you can run faster than a bear. Late afternoon, and another bear sighting! Another large male. This time from afar, it spotted us and came to investigate. You could also tell that he clearly was picking up on the smells of our upcoming dinner. We stayed still, while he watched us from below, the ice sheet was right up against the bow. We were quiet, keeping our movements to a minimum. We were careful not to bang into the metallic structure of the deck, so as to not scare him off with any surprising sounds. Wildlife photographers are accustomed to making themselves small and discreet. But what they couldn’t hide was the frantic paparazzi clicking of camera shutters, as about 5000+ accumulative pictures were taken in just 30mn! He was right below us, on solid ice, so I ran to the dining room below on deck 3, where the portholes gave an amazingly close-up position. While he looked to the cameras above, I enjoyed this quiet moment, looking into his world, as if I was looking through the window of his home. To reach us, Freckles (as he was dubbed from his spotty nose) had clearly swam at some point, his fur was wet and heavy. So once he was bored with us, to get dry, he found a spot where he rolled around until he was dry. Then he went on his way. While on a break, admiring people’s photos on board, I caught a glimpse of the light out through the porthole. 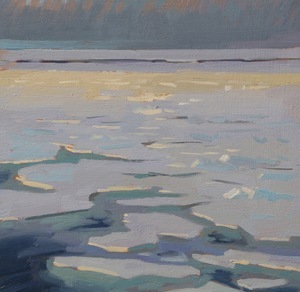 Amazing light on the ice, I ran to grab my paints to try and capture it. With the sun in your back, all the ice was white, and the sea is deep & dark. Turn towards the sun, and it all changes. The ice is now grey, made up of subtle blues, purples, greens, yellows, the sea gets a grey sheen, with a strip of gold reflections pulling you to the horizon. Today, an island is reserved for the painters (Halla Gunnarsdottir, Robert Wyland, and myself) in a bay facing a huge glacier. I’m not even sure if any humans had stepped on here. The ground was soft with thick moss, and obviously it was cold. It was silent, but an ambiance of sloshing & crackling as the ice blocks in the bay were floating about. And every few minutes, a loud cracking sound shook the air, as the distant glacier would shift and break. It was calving occasionally, giving the groups in the zodiacs some exciting moments. I had the reflex of quickly looking up to see falling blocks of ice. But I realised quickly it was useless. By the time the sound had reached me, over 2km, the event had already happened. In the afternoon, I had a go at a charcoal drawing of the glacier. A landing at an old WWII german outpost, at Virgohamma. As usual, anyone who wishes to remain on land needs an armed member of the supervising team to look out for potential bears. I include Magnus in my sketch as he keeps an eye over the area. Time to head across the Greenland sea. The crossing is a test for many. The rough seas of the Arctic can be rough, once you leave the calming of the pack-ice. Just like altitude sickness, sea-sickness strikes young or old, large or small, irrespective of habit or fitness. One of our national geographic photographers, specialising in ocean photography, is green every time, regardless of the hours he has already put in. That's dedication. Swells of 7 metres or so, with dips of up to what felt like 15m, with the ship heading straight into this, the impact was audible, and occasionally the whole ship was shaking with the vibrations. Sleeping was a joke, as if you trying to close your eyes on a roller coaster for 7 hours. The rocking got so bad that I would feel my feet right up against the end of bed, and thought: "it only needs to rock a little further, and I’ll be standing up!" Serving food in the dining hall was quite the joke too, so was keeping your cup of tea from spilling while walking diagonally through the corridors. The only companions we had out here were the petrels. An amazing creature gliding off the updrafts of the waves, and even can sleep while flying. It goes to land only to breed, and the rest of the time hangs out here. This bird, related to the albatross, is not in need of land to feel at ease. These dark unforgiving windy and rough waters are its backyard. I peer out of a window and see land in the distance. It is shrouded with mist, grey sky; this is Greenland! I go out, on the top deck, and this is where I realise what I am facing. The distant silhouette of land to starboard is indeed Greenland. But I realise that the distant silhouette of land to port is also Greenland. This is where it dawns on me that we are not approaching Greenland. We are already in it. This fjord's mouth is about 30km wide. After the pack ice of 81°N, we are now faced with very different ice. We are finally in the land of the icebergs. This fjord is littered with blocks of ice, slowly melting as they descend towards the sea. Our previous fjords in Svalbard would have 1 or 2 large glaciers. Here, we have large glaciers coming in from all sides, and appear anecdotal compared to the size of this fjord. To understand the size of this place, we can compare it to some more familiar places. For example Greenland is large enough to fit any of the following: France x 4. Norway + Sweden + Finland collectively with room to spare. Saudi Arabia. Half of Europe. But even more surprising, is that 3/4 of this country is ice. Its ice sheet is so vast, it is almost the size of Mexico! Now inside Scoresby-sund, we had 300 km to cover, while dodging icebergs. I thought I’d seen wilderness, but east Greenland was another story. The on-board radar was helping our captain navigate these waters. The small yellow dots are all significant blocks of ice. We take the zodiacs out to meet these ice giants. In the sketch below, the dot in the water is a zodiac carrying about 12 people. Without a scale reference, you have no idea how big these monsters are until you are close, and they tower above you like skyscrapers. And they really did have the presence of buildings, but these had been sculpted by giants of nature: the glaciers. This is where I fall in love with icebergs, with their presence being as monumental as the mountains hidden behind them. After slaloming around we head to the Bear islands. They are huge chunks of rock shooting out of the water, resembling the long spiny back of a dinosaur. This area seems to belong to a prehistoric era. Some of us joke that it was a combination of "Jurassic Park" and "Lord of the Rings". We managed to disembark on a stretch of land, after negotiating a very shallow inlet. Sketching time was cut short, as we were asked to rush back to the zodiacs. This shallow inlet was about to get shallower still. The tide was receding, and we risked being stranded. The prospect of a portage involving 2 zodiacs + engines was not anyone's idea of fun. Back on the ship, and heading north. The ship was doing a fair pace, but in my sketchbook, I managed to capture some of the passing features of the fjord. The sun was setting, and we could finally enjoy a proper sunset. Due to the extreme angle of the sun through the fjord and mist, the sky was on fire, whilst the icebergs below were in the shadows and producing an icy blue in contrast with the reds above. We wake up at the top of the fjord. Groups went out to investigate the large glacier. But considering how little time I had to paint, I stayed on board to capture this area's atmosphere, and fascinating rock formations. After lunch, we turn around, and head south. We head towards a site that has the remains of an ancient Eskimo settlement.We are also searching for the musk ox, and from the bridge, Snowy (another one of our eagle-eyed animal spotters) spots a few dark dots in the tundra. A group of 5 seem to be grazing half way up the hills. With my binoculars I keep track of one of them, until it disappears behind a hill. We disembark from the zodiacs, and before we head up the hill, we freeze. For a second, I think we've been caught out by the Musk Ox. Until I realise our attention is focused on.....an Arctic hare. We head up the hill. It's a steep climb, and some have over-dressed and start over-heating quite quickly. The Musk Ox are large, but in this landscape that is their home, they can disappear as they please. From the hill, we can look down on the bay where we spot 3 of them. But there are more, hiding somewhere. While we are distracted by our 3rd Arctic Hare sighting, we don't realise that we are the ones being followed. A Musk Ox is spying on us from behind. Further south, in Harefjord, we take the Zodiacs out to experience the open Tundra. Once on land, we look back and see our ship dwarfed by the icebergs and the vastness of the landscape. Most walk up the hill, while I am interested in the bay and its icebergs. I sit and sketch from a rock, while an ever present rifleman is supervising the area for polar bears. The lapping of the waves on the sand is the only sound here. Until an iceberg cracks, and drops a huge block into the water, creating a large splash. After that, back to silence. In the afternoon we head to Red island. It is surrounded by an area that some call the "iceberg graveyard". The fjord becomes too shallow, and the tall blocks run aground here, and accumulate, creating a maze of massive white walls. Not the safest place to be, as we soon find out. One of the icebergs is breaking, and rolling. We watch as it rolls back and forth like a giant whale. Just as it starts settling, we hear a series of very loud cracks, but nothing seems to be happening. We wait, and wait. Suddenly, between us and the iceberg, a huge piece of ice surges from under the surface, like a breaching submarine! This broke off from deep below, and if we'd been any closer, this would have easily catapulted us out of the water. We get onto Red Island where we have an overview of the "iceberg graveyard". Here there is time to sketch a little more, and again, our ship in the distance is tiny compared to this vast expanse. Our evening is highlighted with an outdoor barbecue on board, as we head outwards from the fjord with another stunning sunset. As it gets dark, we head inside, but our evening is not over, for nature has an extra treat for us tonight. The northern lights! I ask the captain to turn off all lights on deck, to allow complete darkness. We were glued to the spot, and a few of us stayed up, hypnotised until 2am. One of the most unique and memorable nights of my life.